Hatsune Miku (初音ミク) is one of the most regconised characters of the Vocaloid series. And also main protagonist of her own game: Hastune Miku: Project Diva. Hatsune Miku is the first Japanese Vocaloid2 in the Vocaloid2 Character Vocal Series, the third Japanese Vocaloid created by Crypton Future Media, and is the seventh Vocaloid to have appeared overall; released on August 31, 2007. She is considered as the most popular and well known Vocaloid and the first to become a pop idol. The data for the voice was created by sampling the voice of Saki Fujita (藤田 咲, Fujita Saki), a Japanese voice actress. Hatsune Miku is getting ready for another preformance when she notices she lacks the strenght to go up stage. She says she has to find the strength to do this song, so she willl please her fans. She stands up and walks away. Reason: Hatsune Miku sees Shadow standing in the distance and shouts towards him. Shadow turns around and asks what was wrong. She says she's come here to seek her strength. Shadow comments that you can't find that but just can possess it. Hatsune disagrees with his theory so Shadow wants to show her true strength. Connection: Shadow the Hedgehog and Hatsune Miku are both from Sega, although Miku is also still owned by Crypton Future Media. Hatsune Miku comes back from her journey and says that she finally has found the strength she was looking for. She had to do something for it, but she will do everything for her fans. She then goes on stage and sings along with her other friends (Kagami Rin & Len, Megurine Luka, Kaito and Meiko). Hatsune Miku's moveset is based of her songs and various internet video's. Her main weapon in her Leek that she uses in some moves, and other than that she uses hand-on-hand combat and singing in her moveset. - Hatsune slams with her microphone stand. is pressed again she will jump up and punch the opponent again. - spins around with her ponytails spinning too, when she hits an opponent they will get trapped in the attack. (midair) - she goes forwards when doing this attack. - throws a Tako Luka that then sticks to the opponent, having the same effect as Sackbot. - Hatsune will swing with her Leek three times vertically down while running. - throws her Leek diagonally into the air while it is spinning around (like a disc). - Sings a few seconds from Po Pi Po while she dances (kicking her legs forwards). (midair) - sends out Nyan Cat who then runs forwards singing Nyannyannyan. - Hatsune sings a small song, music notes come out of her mouth and float forward. The music notes have the same range as Big Daddy's electro bolt.
. It also deflects projectiles if they aren't too strong. - Hatsune jumps upwards and preforms a strong kick upwards. - a green box appears and Hachune Miku comes out and runs forwards while swining with her Leek. (midair) - same as on the ground but Hatsune first throws it down, which also can hurt the opponent. - kicks down to the ground. (Level 1): Hatsune signs a high note that kills all the opponents close to her. (Level 2): Kagamine Len and Rin appear on their yellow road roller and quickly ride to the end of the stage. (Level 3): Hatsune starts to sing Levan Polka while many Hachune Miku start to attack the opponents with their Leeks. Spin it around - does a spin and punches upwards. Hachune? Go away! - holds a green box when suddenly Hachune Miku jumps out, but she quickly closes the box again. Arattzattza ya ribiraririn raba rittan rindam denrandu Waba rittatta parippari pariri ribiribi risutan denrandu Yaba rindan tenran deiaroo waraba dubudubudubu deiebu Ra rittan dinran denrandu tatatataduuduu deiabuu. Spotlight on! - the spotlights go on and she steps on the stage. I'll sing you a song - throws her microphone (on a stand) aside and gets into battle pose. Forgot the leek - enter with her leek in her hand and quickly puts it away. Always cheer - cheers and jumps into the air. Too happy - claps in her hands out of joy. So much win - spins around and punches in the air. Diva pose - spotlight are on her and she hold her mic in the air. Plumps down on the ground and looks down sad. Falls on the ground after a spin. The default appearance of Hatsune Miku. 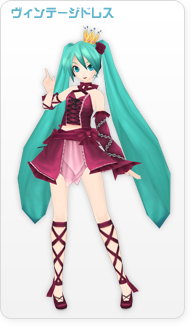 Pink skin: Star Voice- a recolor based on the outfit with the same name of Project DIVA F.
Black skin: Zatsune Miku- recolor of the character Zatsune Miku. White Skin: Racing 2012- a recolor based on the outfit with the same name of Project DIVA F.
A special outfit based on the outfit with the same name from Project DIVA F.
Blue skin: Summer Memory - a recolor based on the outfit with the same name of Project DIVA F.
Purple skin: Purple Agaha - a recolor based on the outfit with the same name of Project DIVA F.
Red skin: Vintage Dress - a recolor based on the outfit with the same name of Project DIVA 2nd. 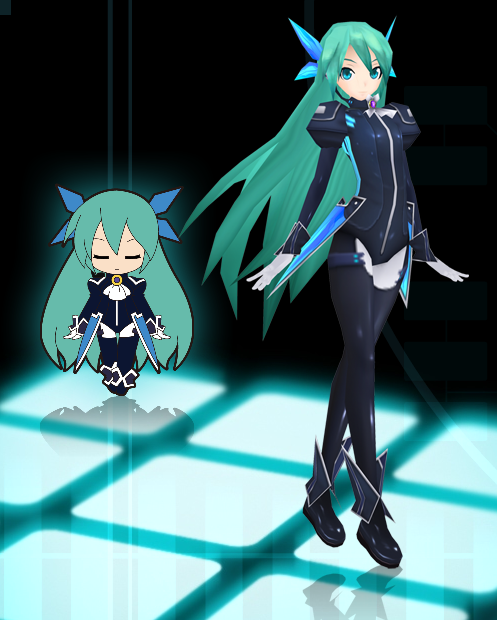 Her appearance based on Vocaloid2: Hatsune Miku (CV01); Append. 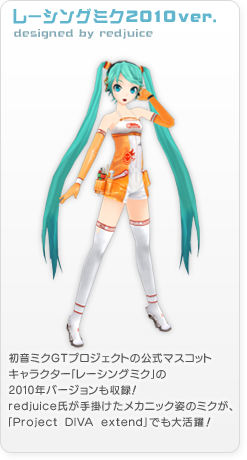 Orange skin: Racing 2010 - a recolor based on the outfit with the same name of Project DIVA Extend. Black skin: Plug-In - a recolor based on the outfit with the same name of Project DIVA. 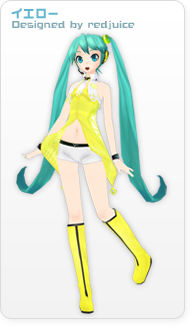 Yellow skin: Yellow - a recolor based on the outfit with the same name of Project DIVA 2nd. Hachune Miku is a minion who is unlocked when reached Rank 8 with Hatune. Hatsune Miku is the second character to only speak Japanese, the first one being Heihachi Mishima. She also is the second one using music, the other one begin Parappa. Miku's level 3 super cinematic is 16 seconds long, as it only play the first couplet.